Attention all athletes, Road ID has launched its new Road ID Application which allows your friends and family to track your running, cycling, hiking, walking and basically any outdoor adventures in real time. 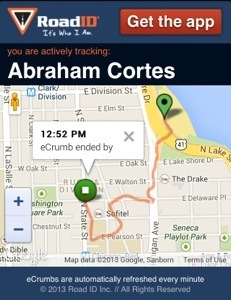 The Road ID App has some amazing features such as eCrumb Tracking, a Stationary Alert, and a Custom Lock Screen Creator. Assign the duration of the activity. Select a quick message or customize your note for your emergency contact(s). You can also select Stationary Alert. 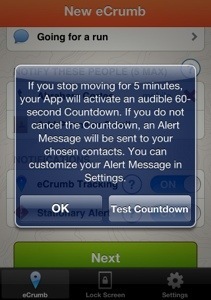 Which will notify you and your contact(s) as soon as you stop moving for five minutes. 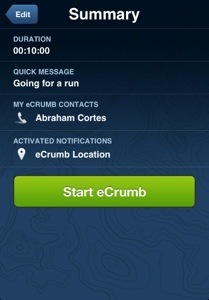 Review your eCrumb Summary and start your activity. Track me link shows a map of your route from start to finish. It highlights start and end times. 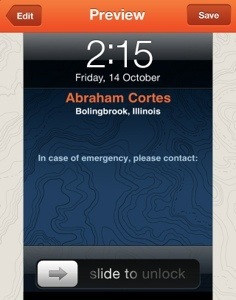 Here’s a Lock Screen view of your emergency contact information. Please note, this app is not a replacement for a physical Road ID. This app is intended to be a supplemental safety device only. I highly recommend purchasing a Road ID and downloading this FREE app for your friends and family peace of mind. Thanks Road ID looking out for us and keeping our family and friends informed. This entry was posted in Running and tagged #C4Athletics, #F3Community, #gobigorgohome, #Instarunners, #Runaholics, #RunChat, #RunThisYear, 13.1, 26.2, Athletic, Boston Marathon, C4 Athletics, Challenge, Chicago Marathon, CM13, Cross Fit, eCrumb, emergency alerts, Endurance, F3, Fitfluential, Mamavation, Marathon, Road ID, Road ID App, RUNEMZ, Running, safety, social media, Tracking Device, Training, Triathlon, Ultra Running by @Abe_Cortes. Bookmark the permalink.